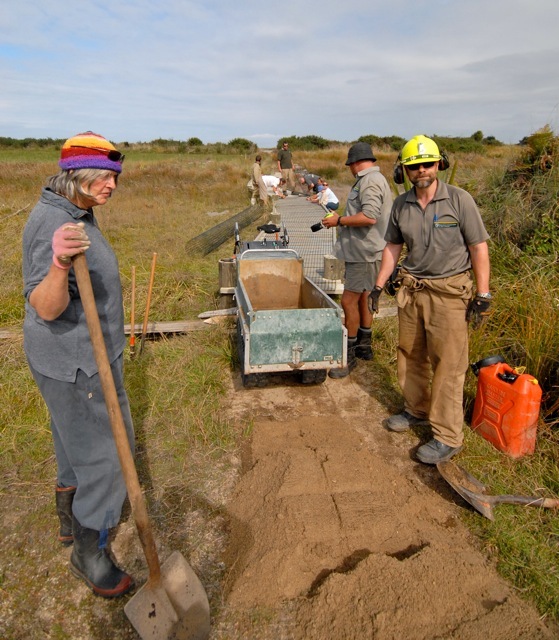 Department of Conservation (DOC) staff from Westport and Karamea Estuary Enhancement Project (KEEP) members met on March 16 for a working bee at the Karamea Estuary to celebrate the retirement of long-serving DOC employee and KEEP member Barry Chalmers. KEEP Chairman George Snowden welcomes KEEP and DOC volunteers to the estuary working bee. 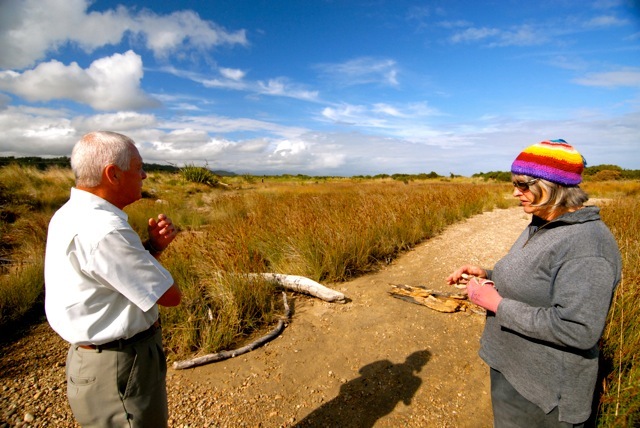 KEEP is a joint venture project between DOC and members of the Karamea community that began in 2006 to build a walkway around the Karamea Estuary to allow easy access to the area and showcase the environmental, historical, ecological and anthropological significance of the estuary for visitors to Karamea. Staff from the DOC office in Westport and local DOC workers gathered in Karamea to farewell Barry and agreed to do some work with KEEP volunteers while they were in the area. 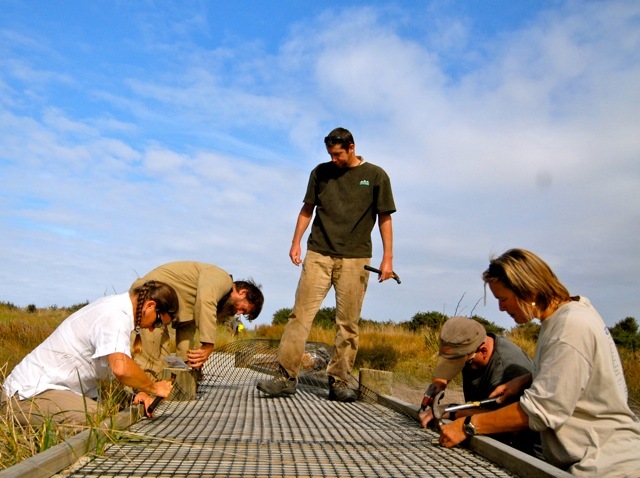 Work included; preserving the historical rock wagon at the beginning of the walkway, building a ramp onto either end of the boardwalk on the walkway, tacking slip-proof mesh onto the boardwalk and clearing the gorse and overgrowth from the southern part of the estuary walkway. 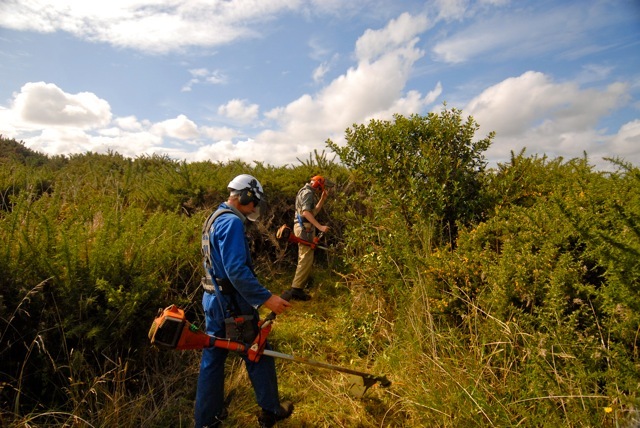 Barry was initially employed by the New Zealand Forest Service in 1964 and joined DOC in 1987 when the conservation and environmental arms of the NZFS were assumed by DOC. He has worked in the Karamea region for the NZFS since 1969 and later with DOC until his retirement on March 16, 2012. 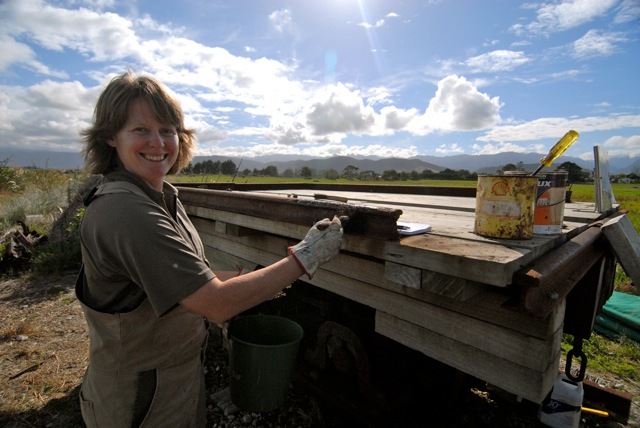 He worked extensively on the Heaphy and Wangapeka tracks, the Oparara Basin biodiversity programmes helping to protect endangered species like kiwi, native bats and blue ducks. 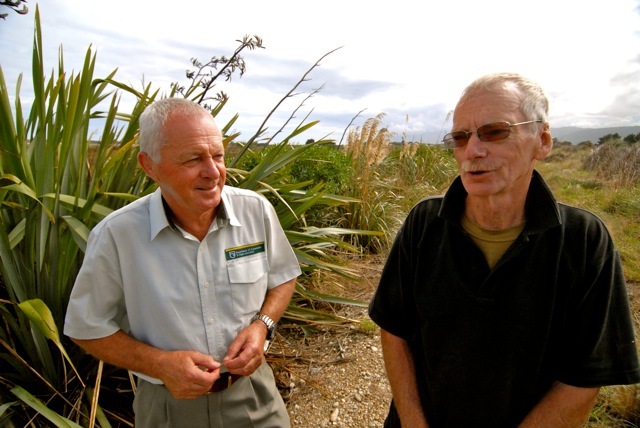 The Karamea community has benefited greatly from Barry’s generous nature and he has done much over the last five decades to help build the community. As a key member of many local organisations, he is a board member and trustee of the Oparara Valley Project Trust, which has recently acquired the lease of the Last Resort tourism complex in Karamea to ensure that the amenity remains open for the benefit of the local community. 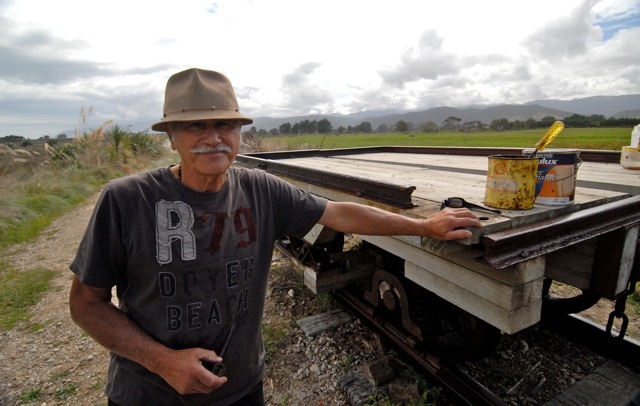 In addition to being a KEEP stalwart and a DOC legend, he also organises local wood-chopping events, has written two Karamea history books and is working on two more; an account of the railway systems in the Karamea region and another about the local fire brigade, which is nearing completion. Barry and wife May intend to continue living in Karamea and maintain their support of the many community projects they have been involved with. Family members and friends are apparently urging Barry to pen an autobiography and others are suggesting he run for a position on the Buller District Council. It sounds like Mr. Barry Chalmers will be even busier in retirement that he was throughout his working life. Congratulations Barry on an illustrious career that has brought much good to the Karamea region and we wish you a long and happy retirement. This entry was posted in Buller District Council, Conservation, Department of Conservation, Environment, Fitness, Historical, Humor, Humour, Kahurangi National Park, Karamea, Karamea Estuary Enhancement Project, Mountain Biking, MTB, Nature, New Zealand, Paul Murray, Photography, Social Commentary, South Island, West Coast and tagged education, Humor, Humour, karamea, Karamea Estuary Enhancement Project, KEEP, New Zealand, Photography, Social Commentary, South Island, Travel, West Coast. Bookmark the permalink. I have been looking at your website. Can you help me, Where can I buy the non slip mesh used by DOC on tracks. G’day Andy, the mesh we used was supplied by DOC, but I’ll ask the crew and see if I can get a more definitive answer for you. Did you get an answer where to source the mesh?